This book stands against the current of judgments long settled in the schools of law in regard to classic cases such as Lochner v. New York, Near v. Minnesota, the Pentagon Papers case, and Bob Jones University v. United States. 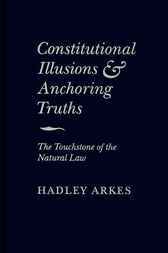 Professor Hadley Arkes takes as his subject concepts long regarded as familiar, settled principles in our law - 'prior restraints', ex post facto laws - and he shows that there is actually a mystery about them, that their meaning is not as settled or clear as we have long supposed. Arkes shows this in his text, arguing that the logic of the natural law provides the key to this chain of legal puzzles.